【Bluetooth 4.2 Stereo Sound with Thin Speakers】thickness is only one-third of the average speaker, which is very comfortable for sleepers. True HD high fidelity sound featuring latest Bluetooth 4.2 technology that produce great sound quality, bluetooth can pair your iPhone X, iPhone 8 or any other Smartphones iPad Tablets easily. It is the best gift for family or friends on travel and airplane in Festivals. 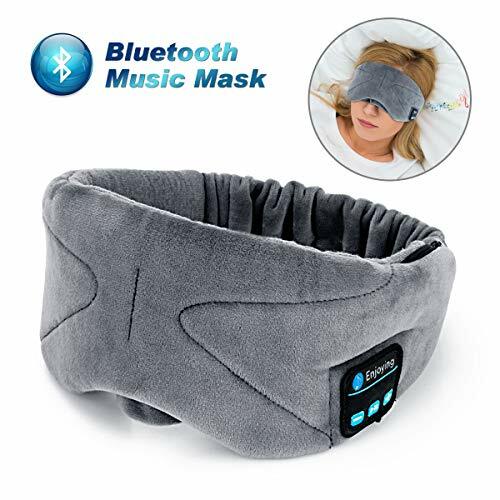 【Comfortable Material and Washable】Music bluetooth eye shade is made from elvet and elastic cotton, and provide a soft and comfortable feeling. Fabric liner separated from stitching is not defective,it is the place to take out the bluetooth module, so you can full wash the eye mask. 【Sleep Deeply Anywhere, Anytime】Block light to make your sleep better, allows you to listen to music without wearing additional headphones, which make you fall asleep faster. Extra cushion makes eyemask and nose touch better, which can be completely shaded. Best for frequent flyers to sleep on long flights or sensitive sleepers (insomnia) who dislike glaring lights in any occasions. Sleep in a light blocked world whenever and wherever. Perfect for air travel, relaxation, meditation, insomnia.